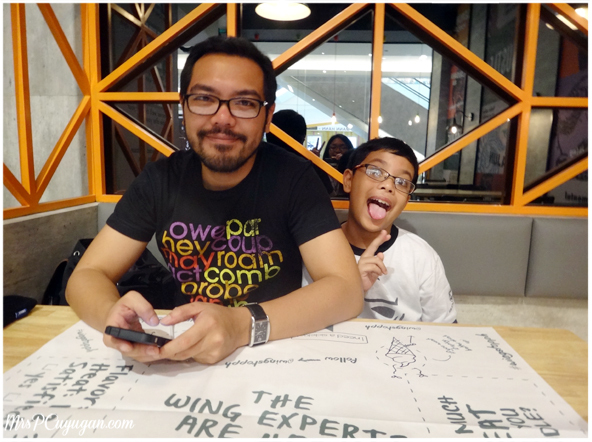 Fact: We don’t usually go out on Mother’s Day, Father’s Day or any other commercial holiday. That’s because we aren’t too fond of crowds. I also don’t get flowers often, but this year MrC got me a nice big bouquet. So, as you can see, our Mother’s Day celebration was really far from our usual. Instead of the typical brunch at a nearby restaurant plan, the boys and I actually headed out over Mother’s Day weekend. Fortunately, we weren’t faced with large crowds in each place that we went, so yay. Pretty strange, or should I say lucky, considering that our first stop was Megamall. Believe it or not, we braved EDSA on a Saturday so that I could attend an event. So unlike me, but really worth it because it was a great event to be at. Little MrC and I were invited to check out the Scotts Vitamins #Momazing event, along with some other mommies. I’ll be writing more about this activity in another post, but for now I just have to say that it was a really inspiring experience. I always learn so much whenever I hear stories about motherhood, and the women on the Scotts panel were definitely worth listening to. 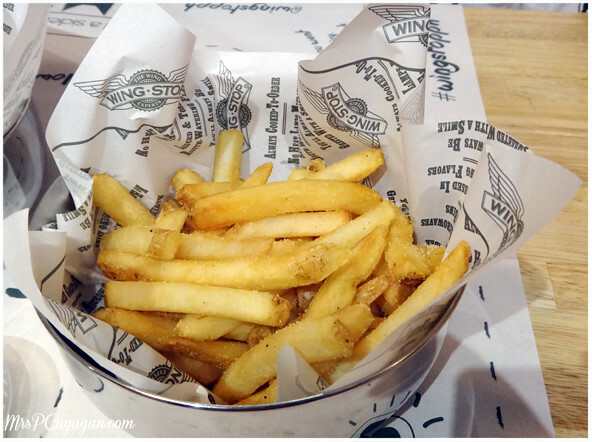 Next stop was lunch at Wingstop in Estancia Mall, Capitol Commons. We wanted to make the most out of the fact that we were already beyond Makati, so we chose to have lunch here before heading back home. I had originally wanted to eat somewhere in Megamall, but I saw how the crowd was starting to get bigger, so Plan B it was. I absolutely love buffalo wings and bleu cheese dressing, so I was happy with our choice of restaurant. The boys were too, and I know this because everything that we ordered was completely wiped out. 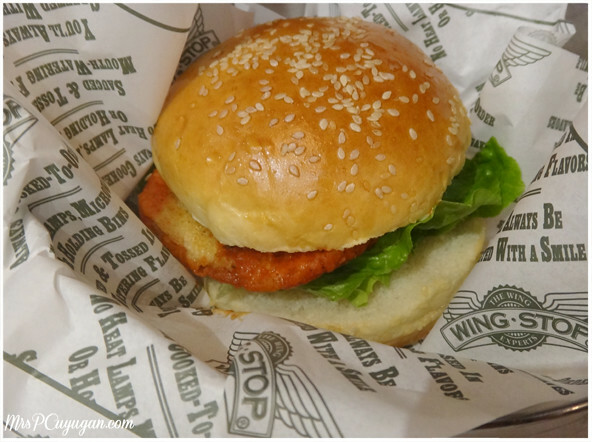 MrC ordered the Cajun chicken sandwich. Not as spicy as we thought it would be. We actually ended up getting an additional order of chicken wings coz what we initially got wasn’t enough. We chose Hickory Smoked BBQ for the wings we added, but I have no photo because we attacked as soon as it was served. 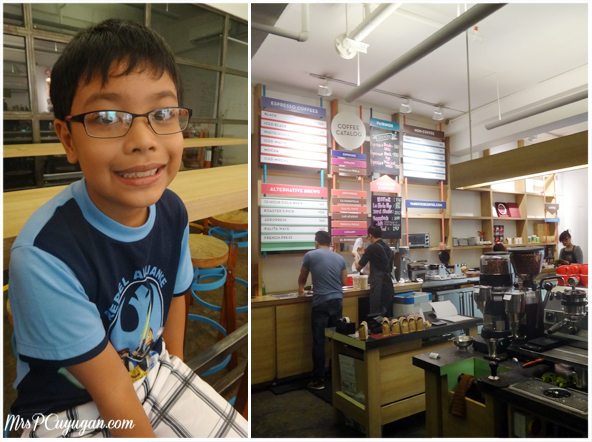 The following morning, we found ourselves off to Makati for brunch at Yardstick Coffee. Thankfully we didn’t hit any traffic, and when we got to the cafe at around 10:30 AM there weren’t that many people. I think we may have just missed the breakfast crowd and we were early for lunch. I’ve heard a lot of nice things about the coffee that they serve at Yardstick, and I’m happy to say that they didn’t disappoint. Because the weather has been so hot lately, I chose to go with an Iced White. 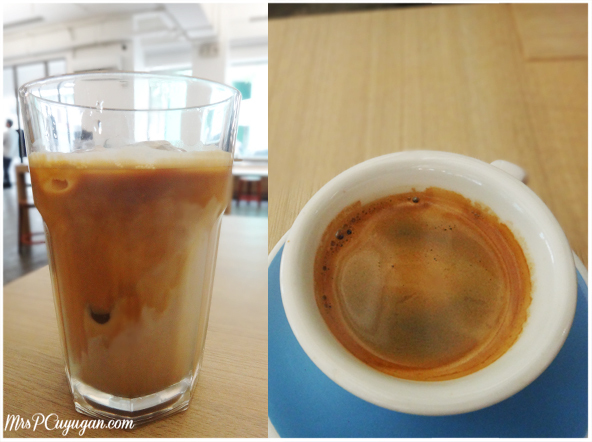 MrC, on the other hand, ordered his default Double Espresso. I really wanted something salty, so I chose a Tapa Sandwich for my meal. I loved this! It was nicely toasted and covered with cheese. Super yummy. 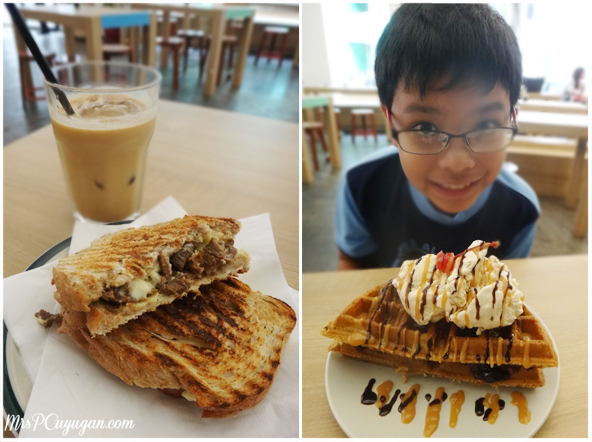 The little boy ordered a Peanut Butter and Jelly Waffle, which was served with a huge scoop of ice cream on top. The waffle was really, really heavy, so I had to help him finish his food. Lol. MrC ordered the Apple Pie Waffle, which was also really good. 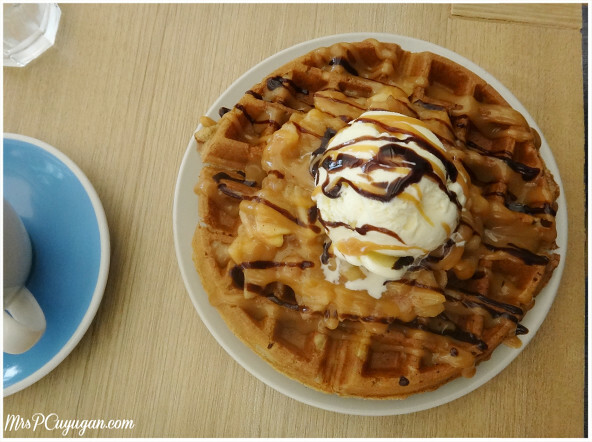 The pie filling on top of the waffle was perfect with the vanilla ice cream scoop over it. This felt more like dessert than breakfast, though, but I’m not complaining. Apple Pie Waffle for MrC. This one is a must-try! After brunch, the husbandry and I went window shopping for the new house at Wilcon and Abenson’s. We did quite a lot of walking, and it was really hot throughout the day, so you can imagine that we worked up quite an appetite for dinner. Yes, like I said before, we love to celebrate with food. For dinner my siblings, the boys and I took mom out. She was craving for burgers so we chose to eat at The Farm Organics. This restaurant used to be in Alabang Hills, but they recently moved to Commercenter. There have been many rave reviews about the food here, but I also remember reading someone complain about the noise at the Alabang Hills restaurant. Well, the Commercenter restaurant is pretty noisy too when full, and that was the one thing I didn’t really like about our dinner experience. Free dessert for the mommies! Yay! 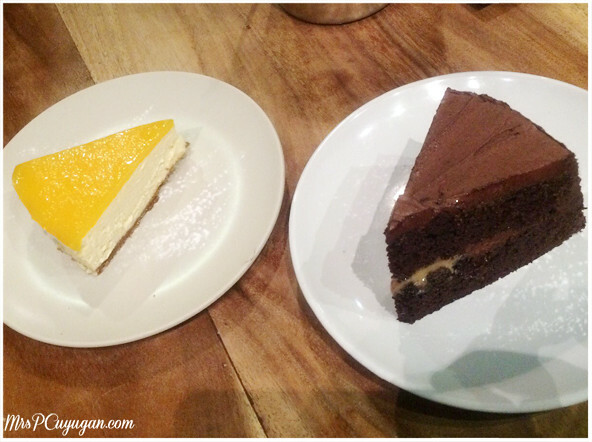 The Mango Cheesecake is a must-try. Anyway. We all chose to order burgers, but there are a lot of other items on the menu which I hope to try soon, like their organic steaks and fresh pasta. I chose the Three Cheese Burger which had cheddar, mozzarella and bleu cheese. It was good, but I would have wanted a bit more bleu cheesiness in my burger. The kiddo had a Bacon Cheeseburger, which he happily ate all on his own. MrC ordered a Double Cheeseburger, which was also yummy. If you like your burgers beefy and charbroiled, this is the place for you. Prices are a bit steep, as you would imagine, because their meats are all free range and organic. I say it’s worth the splurge every once in a while. Oh, and when you do visit, choose the sweet potato fries over the regular ones. So good! All in all, it was an amazing Mother’s Day weekend filled with food, fun and family. I couldn’t have asked for more. Now make me kwento, how did you guys celebrate Mother’s Day? Food galore! Now that’s my kind of Mother’s Day celebration. Ours was pretty tame this year. Just dinner out but we took my mom with us too. It’s usually just me, hubby and kids. We didn’t go out on Mother’s Day because like you we don’t like crowds too. 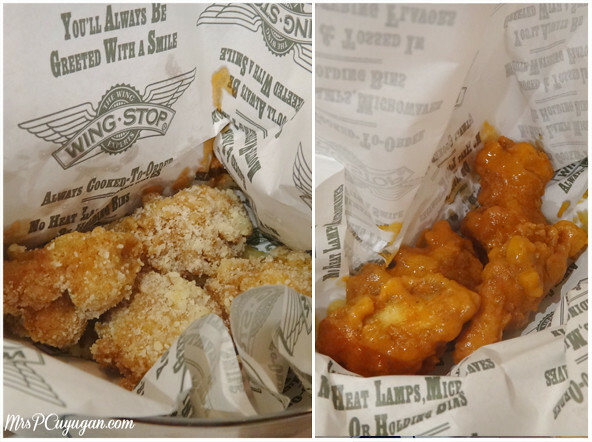 We love Wingstop, though! Hubby’s favorite is the Louisiana Rub. Belated Happy Mothers day to you! What a way to enjoy your day to be with your family all day and enjoying the food. Belated Happy Mothers day to you…wowww. 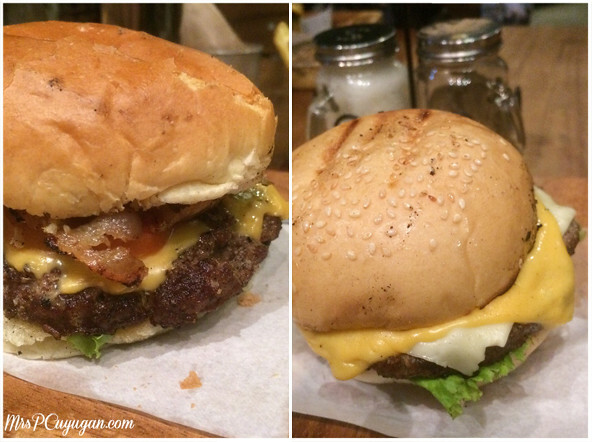 I love that double cheese burger from the organic farm–really beefy as it shows!!! It’s super duper beefy! Heavy enough to share, too! 🙂 Thank you for the greeting! Happy Mothers Day. It looks like you had a great family time during Mothers Day. Belated happy mother’s day. It was a good sign that you didn’t start your celebration with a huge crowd. The plan B was super since you super enjoyed the celebration with the fam bam! that’s a great mothers day activity! it’s a special occasion and glad to you enjoyed it, the food looks yummy! I have not been to The Farm in ages but I love their food – can’t finish a serving but I heart that it’s organic. My body can tell the diff when I have something organic & fresh. I will try their double cheeseburger next time.